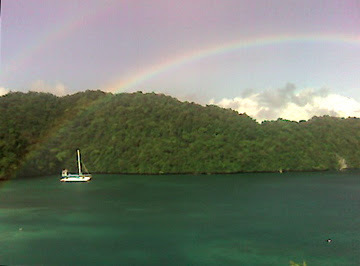 Rainbows are commonplace in Palau. The rock island across my hotel room balcony during my visit to Palau in 2006. MANILA, Philippines — After relaunching the route in May, Asian Spirit will be dropping its flights from Koror to Cebu, effective Monday, Nov. 5. Asian Spirit, he said, is preparing to “engage in a major battle” with the larger-capitalized airlines in the Philippines, which are going to fly to Caticlan, the gateway to Boracay Island, Aklan. “We want to focus on our turf, which we had developed when no one was flying to the destination yet.” The Manila-Caticlan service is often called the “bread and butter” route of Asian Spirit, which helps subsidize its flights to 15 other destinations. The other destinations are considered vital in terms of public welfare but are typically low revenue earners for the airline because of unstable passenger loads. The news of the suspension caught most tourism-related companies in Palau by surprise. It was only in September that Asian Spirit hosted a familiarization tour in Cebu for Palau government officials, businessmen and media. Reacting to the development, Sam Scott, president of Palau Sea Ventures Inc. and Sam’s Tours; said, “This is very sad and unfortunate news that is very disappointing, to say the least. Sam’s Tours has been working very hard with [Asian Spirit] and hosted many [familiarization tours], including the most recent one from Cebu.” On June 16, Sam’s Tours co-hosted a familiarization tour with the airline and other Palau tourism and business groups for about 60 visitors from Cebu, which included dive center owners, travel agents, media, airline staff, business delegates and other dignitaries. Interviewed in Manila, Surangel Samuel Whipps Jr., whose family co-owns Palau Micronesia Air — Asian Spirit’s partner in Koror — told the Journal, “You know, Asian Spirit has been very good to Palau. They’ve been able to provide competition [for other carriers] which is good for Palau because there have been a lot of visitors. Unfortunately, the number of people traveling [the Cebu-Koror route] was not enough. So we’re looking at how to market it. Maybe it was our fault — the marketing was not ready for Cebu. We expected more people, but the tourism connections were not there yet.” The Whipps family’s Surangel & Sons acted as the general service agent for the Philippine carrier. Palauans welcomed the entry of Asian Spirit in Koror because it helped bring down the cost of airfare to the Philippines, where a number of them have business dealings, go shopping, and receive medical treatment. Roundtrip fare from Koror to Cebu cost $330 per person, the same rate now offered by Continental Air Micronesia, which flies Koror to Manila. When it was the only airline serving the Koror-Manila route, Continental’s airfare reached as high as $600 per person especially during holidays. “I just checked with Continental because we wanted to come here in December and their rate’s already $510,” Whipps said. “It’s interesting what Continental will do now that they have their monopoly back,” he added. Whipps added the Koror-Cebu route had “a lot of potential. Palau was going to tie up with Cebu Doctors Hospital and two other hospitals in Cebu. It’s much closer and with the flight frequencies, it would’ve been better for our patients. Also there were a lot of business opportunities...people are so used to coming to Manila, they don’t think of Cebu. As one Cebu businessman told me, the minute you step out of the plane, you don’t need to go to Manila anymore because you can find everything in Cebu.” Cebu is the second major urban destination in the country after Manila, the capital. For its part, Asian Spirit is expected to go head-to-head with larger and more profitable airlines to protect its Caticlan route. Air Philippines, the budget carrier of Filipino-Chinese tycoon Lucio Tan, who also owns Philippine Airlines, will be flying to Caticlan by Dec. 15 using three to six Bombardier Q300 50-seater turboprops; Cebu Pacific, owned by JG Summit Holdings Inc., of food and beverage magnate John Gokongwei, will be flying to Caticlan by February 2008 using two Avions de Transport Regional 72-500s turboprops initially, gradually increasing to 14 by 2013.